Freedom and Flourishing: How does income inequality affect happiness? Early yesterday the thought occurred to me that it might be a good idea to write something about the effects of inequality on happiness levels. I have been thinking that the judgements people make about inequality are more like judgements about the characteristics of a good society than judgements about the effects of inequality on aggregate happiness (whatever that means). I thought I would spend an hour or so bringing myself up to date with the literature and then another hour or so writing something - and the rest of the day in the garden. However, the process has taken longer than I thought it would (and this post might also take longer to read than some people might think appropriate). The issues involved are fairly complex. There are at least three different aspects of the relationship between income inequality and happiness that might be relevant – the effects of relative income levels on happiness, the more general effects of income inequality on happiness and the effects of income inequality on happiness inequality. · Life satisfaction of men is more affected by relative income than that of women. · Comparisons with friends and neighbours are less important than broader comparisons with the whole population. · Those who perceive income comparisons to be important tend to have lower life satisfaction. · The negative effect of relative income comparisons for those with below average incomes is balanced (from a Benthamite perspective) by the positive effect for those with above average income. Does inequality have an effect on life satisfaction over and above the relative income effect? Studies which have attempted to answer this question have often reached different conclusions. A recent study by Paolo Verme, which seems to be technically superior to previous studies, has found that income inequality tends to have a significantly negative effect on life satisfaction, after controlling for relative income effects etc. The results seem to apply in western countries as well as non-western countries and to rich people as well as to poor people. This raises the question of why income inequality might have these effects. One possibility is that people feel more comfortable in societies where opportunities are relatively equal. Another possibility is that they are more concerned about equality of outcomes. If so, it seems reasonable to suppose that they are concerned about income inequality because they think it results in happiness inequality. 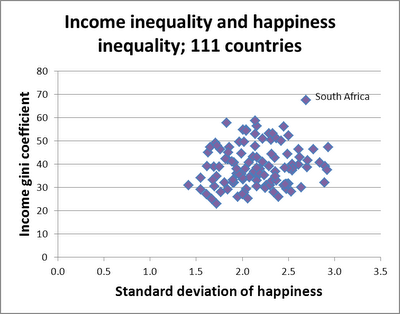 The absence of a strong relationship between inequality of income and happiness at an international level is consistent with the observation of Betsey Stevenson and Justin Wolfers that there has not been a close link between trends in happiness inequality and income inequality in the United States. It is also consistent with the findings of a paper by Leonardo Becchetti et al, based on panel data, that the increase in income inequality has not been one of the drivers of the increase in happiness inequality in Germany. So, how did this information enlighten me on the question of whether the judgements people make about inequality are more like judgements about the characteristics of a good society than judgements about the effects of inequality on aggregate happiness? The effects of relative income on life satisfaction do not seem relevant to this question. The relationship between income inequality and individual happiness does seem relevant, but I suspect it has more to do with empathy with compatriots and a desire to alleviate suffering of people near the bottom of the income scale rather than a more general concern about distributional equity. Happiness inequality also seems relevant. When Ruut Veenhoven argues that the quality of a society should be judged by the disparity of happiness among its citizens as well by average happiness levels, he is clearly making a judgement about the characteristics of a good society. 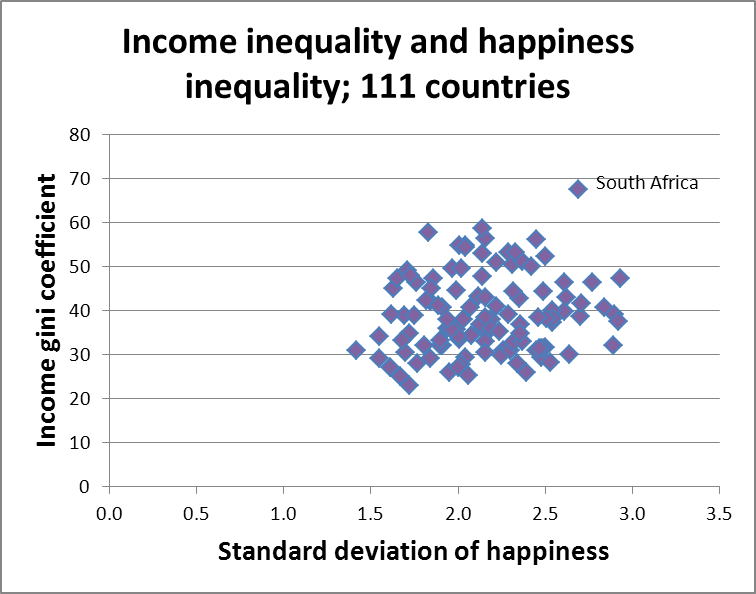 The weakness of the relationship between income inequality and happiness inequality certainly suggests that caution is required in basing judgements about the relative quality of different societies on income distribution data. The question I am left with, however, is to what extent disparities of happiness can be attributed to government policies and societal institutions (the rules of the game) rather than individual and group behaviour. It seems to me that to the extent that we introduce distributional considerations into our consideration of the quality of different societies, we are on safer ground in basing our judgements on the distribution of opportunities that are offered, rather than on the distribution of happiness outcomes. I agree FXCM. A society in which the rights of all are equally respected will be a peaceful society. It will also provide widespread opportunities for individuals to better themselves. However, it seems to me that a good society would also ensure that all members have some economic security (i.e. capacity to survive periods of ill-health, unemployment etc).